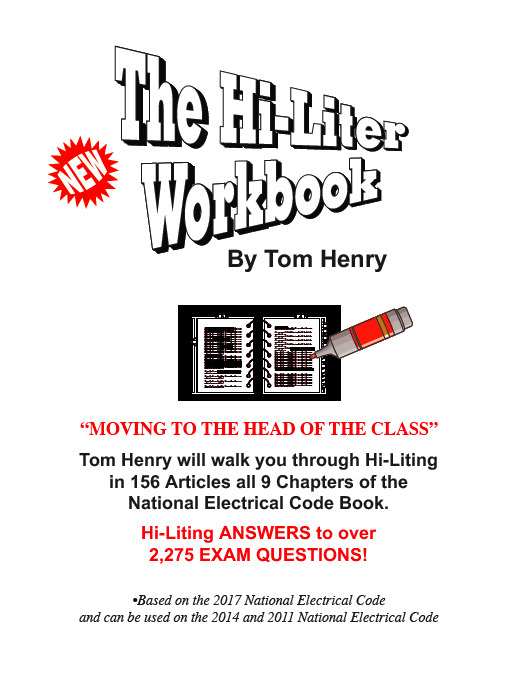 "Moving To The Head Of The Class"
You will learn the Code with this COMBO as you will be introduced to all 156 Articles by "Hi-Liting" over 2,275 electrical exam answers with pictures and a summary by Tom Henry of each Article and another over 425 exam questions from the Code Tables book for a total of over 2,700 answers! 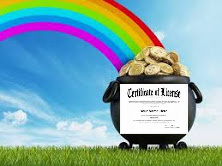 These exercises of "Hi-Liting" the answers from Article 90 to the end of Chapter 9 will be equivalent to finding the reward at the end of the RAINBOW! "Perfect Pratice makes Perfect! Why continue taking another exam and making another donation to the building department? 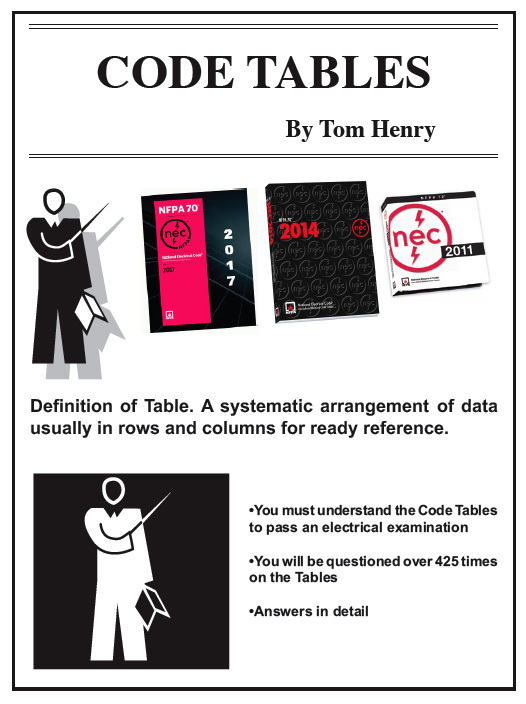 Properly prepare your Code book to the actual Code book Tom Henry uses daily. 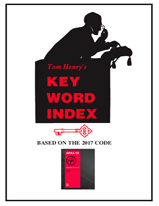 Albert Einstein, Harry Houdini or David Copperfield with all their knowledge and magic couldn't find the answers to these exam questions in 2 DAYS without the Key Word Index!!! You can try it and see if 6 questions x 2.4 minutes = 14.4 minutes is enough time for you! (a) Open all grounded conductors when manually placed in the "off" position. (b) Be designed so that the circuit cannot be energized automatically if the device is manually placed in the "on" position. (c) Be provided with a positive lockout in the "off" position. (d) Be provided with a positive lockout in the "on" position. #2. The use of the term ____ is intended to convey that a controller can be operated via another means or location through communications without a direct operator interface with the controlled device. #3. Potential transformers, and other switchboard devices with potential coils shall be supplied by a circuit that is protected by standard overcurrent devices rated ____ amperes or less. #4. Transformers shall have a secondary short circuit current of not more than ____ mA if the open circuit voltage is over 7500 volts. #5. Joints in festoon wiring shall be ____. #6. The neutral of feeders supplying solid-state, 3-phase, 4 wire dimming systems shall be considered a/an ____ conductor. There is NO shortcut in learning the Code book, as an instructor starting to teach the Code this is an excellent way to start out and the book has a summary at the end of all 156 Articles. It's a "workbook" and by doing the work the student will move to the "head of the class." Over 2,700 exam questions with answers in the COMBO!